It’s a little known fact that animals made up sizeable portions of the crew in the early days of piracy and in fact some ships were entirely staffed by our four-legged friends; Piggy Pirates is an online slot which tells the tale of one such ship – it comes with a clever feature and a tasty progressive jackpot. 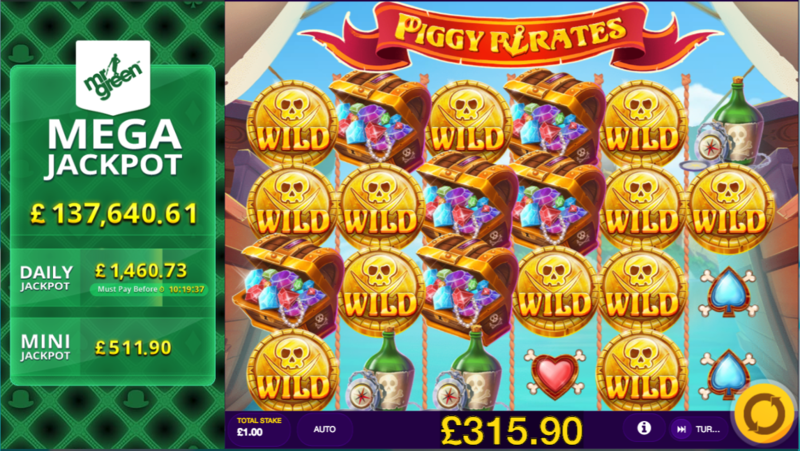 Piggy Pirates is a six reel slot with four rows and forty fixed paylines; those reels float over the blue sea between two opposing pirate vessels while the progressive jackpot totals tick slowly upwards on the left hand side. 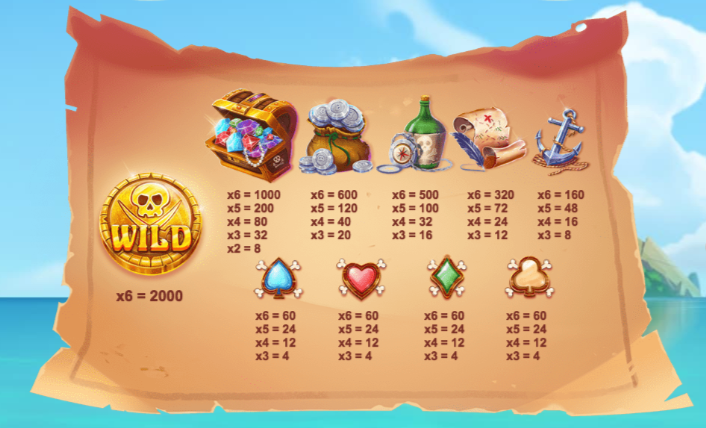 The higher value symbols include a chest of jewels, a pouch of silver coins, a bottle of grog, a treasure map and an anchor; playing card symbols in blue, red, green and yellow make up the lower values. There are no wilds in the base game but there are the pigs which we’ll explain below. The pigs are scatter symbols which move horizontally one position with each spin; if you can land three in view at the same time then free spins will be triggered. You’ll receive an unlimited number of free spins when this round starts and you’ll notice that the pigs all drop to bottom of the screen; each time a wild gold coin lands they’ll collect it and add it to the total shown at the top. The spins end when the wolf pirate symbol lands on the reels and chucks a bomb, blasting all those wilds back onto the reels for one final (hopefully lucrative) spin. This is triggered from the base game by landing three of the jackpot symbols which will award either the Mega or Mini prizes shown to the left of the reels. There’s also a Daily Jackpot which must pay out before the time shown. Piggy Pirates is a slot which comes with pigs, pirates and a progressive jackpot so it’s easy to like even before you begin to enjoy the cartoon-style gameplay and clever bonus features. Certainly worth a spin and it comes with an RTP of 96.11%.